More than just a fortune cookie diversion, K’ung Fu-tzu (known as Confucius to those first foreigners who wished to give him a more Roman-sounding name) is also referred to as Kong Qui. He is a revered Chinese philosopher born in 551 B.C. Confucius’ teachings were in line with the Greek philosopher Aristotle, who said, “We are what we repeatedly do.” This is why Self-Awareness is key to corporate leadership and organizational culture. We often underestimate the power we have to shape our lives, perspective, and the lives of those around us. This is a story of my latest flight on Delta, how I met a stranded Chinese couple, and the ability to make a positive impact within a personal sphere of influence. My gate was 52 gates down (i.e. essentially 1 kilometer). Despite the roller bag and computer bag, I was determined to make it…I’m a runner, and I had just promised my kids I would check in on them as they lay sleeping. I asked her to please call the other gate to let them know I was on my way. I arrived two minutes before the scheduled departure. The two desk agents closed the door on me. The pilot looked at me through the cockpit window as I looked at him sitting there ready to go. I implored the desk agent to be let onto the plane. The gate agent refused to re-open the door and told me that it was all my fault. She told me that had I arrived “three minutes early, instead of two minutes,” then they would have let me on the plane. Agreed, it was my mistake; AND, what role does Delta have in this mix-up? I asked, “Why would Delta place a NON-passenger flight on a PASSENGER board? ?” (Not to mention, why was it one minute apart from another Nashville-bound flight, at the near opposite end of the terminal?). Kim, the gate agent, was initially unsympathetic. Due to my demonstration of feeling consumed with the guilt of breaking a promise to my children, the agent eventually demonstrated some sympathy by apologizing, re-booking my flight, and providing me with hotel/breakfast vouchers. Still, their system did not make sense to me, and I worked to remind myself as I stood there frozen in disbelief that everything happens for a reason. Suddenly, a non-English speaking couple from Kun Ming, China, showed up at the counter, trying to make their way to Charlotte, NC. My Delta gate agent told them repeatedly in English that their flight was “tomorrow.” They didn’t understand her, and she didn’t do anything other than repeat herself. Then, it hit me. I could be a change agent and make a difference. Yes, I could remember how to communicate in Mandarin from my Rosetta Stone lessons from 8 years earlier. “Fei ji bu-hao” (The plane is not good), I told them. They responded in shock and understanding. “Wei” (yes), I said. “Follow me.” I took them to the Need Assistance phone, but ended up having more success calling their friend in Charlotte. Then, I used Google Translate on my phone to show them that their luggage was already in Charlotte and they would have to spend the night, like me, in Detroit. 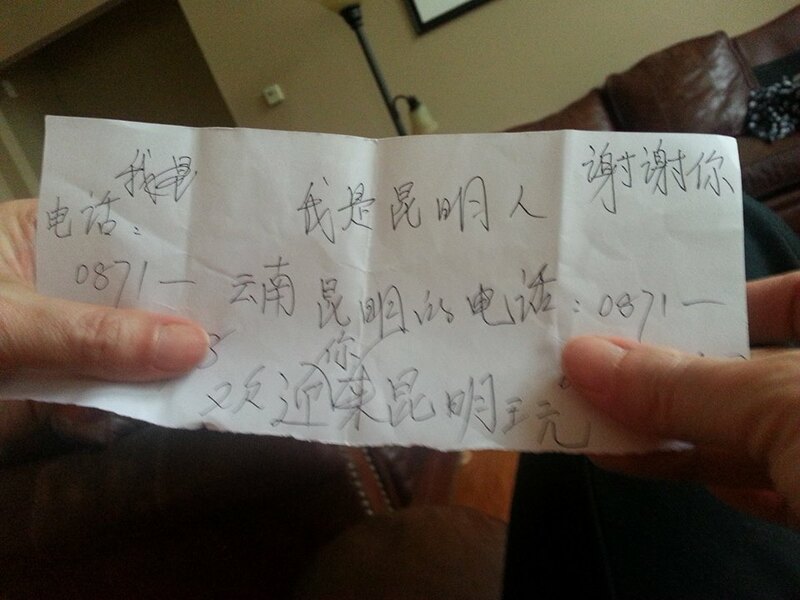 Before I left, they wrote me a message, which translates into “Welcome to Kun Ming” with their phone number on it. They were inviting me to visit them in their home. They shook my hand heartedly. “Xie xie” (Thank you)! And just like that, I changed my little world, and assisted in a small piece of theirs. The outcome of my situation changed completely because I chose to behave kindly even when I was not in the mood to act kindly. Everyday practices, like a smile and a simple gesture, can lead us to become more interconnected. Rossina Gil, MSOD, MAIS, is a Change Agent, a Leadership and Organization Development Practitioner, and the founder of a virtual consultancy of OD experts, CLG. Please visit CorporateLookingGlass.com. Posted on April 6, 2014, in Uncategorized and tagged Chinese philosopher, Confucius, Delta, Kúng Fu-tzu, Kun Ming, Proverbs 3:27. Bookmark the permalink. 4 Comments. This is a great real life story of how truly interconnected we are and how life presents opportunities daily to connect with someone else…….the sad thing….is most of the time we miss these opportunities because we are moving so fast and engrossed in our own issues….when we take the time to be aware of and sensitive to what is happening around us and respond……a whole new world is opens up to us and it is beautiful. !…kind of like watching a beautiful flower open up in slow motion…..